Journalist Laura Snapes managed to progress in her chosen career despite dropping out of university twice, but she hears from others about their reasons for leaving university. 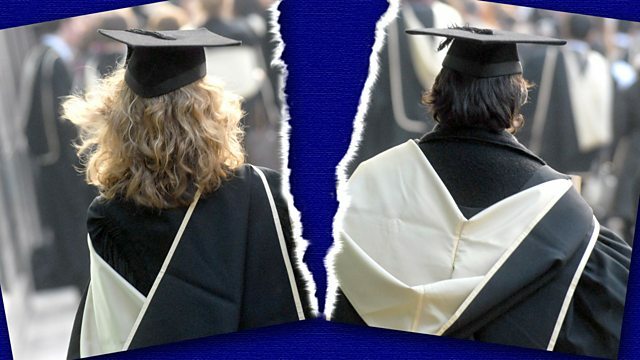 There can surely have never been so much pressure on young people to go to university and get a degree, but while for many it remains the best option for securing a decent future, many thousands of others choose to leave higher education and make their own way instead; nearly 25,000 students dropped out in the last year figures are available. Laura Snapes is a journalist who dropped out of two different universities herself, deciding she'd be better off trying to forge her path in her chosen career by doing rather than learning. In this programme she meets other drop-outs to find out what their motives were for leaving higher education behind, and whether they regret their decision. She'll hear how some feel university was never really for them, while for others the pressure of having to succeed, combined with the shadow of their mounting debts, led to mental health problems that forced them to quit. Laura also finds out from her own parents what they really felt when she broke the news that their daughter was dropping out not once but twice.